Liestal Alley, post-Old Soul Co.’s move. Liestal Alley renovation, in progress. 1. Kickstart the Local Economy: Small business are the backbone of California’s economy, accounting for 99% of California’s employers and employing 52% of California’s workforce. You have to support small businesses to sustain small businesses though. Which is one of the reasons Shine Café on E and 14th serves strictly local fare, from local beer and wine to local coffee and pastries. Order lunch over at the Old Soul Co, and everything served on your plate, from the salad dressing to your sandwich bun was either made in-house or by a Sacramento local, on fierce principle. Insight Coffee Roaster’s food menu might be limited to pastries, but every one of those delectable is made right here in Sacramento too. Coffee shops also serve as venues for local musicians and galleries for local artists. 2. Revitalizing their Neighborhoods: Twelve years ago, Liestal Row was a downright unsavory alley running between 17th and 18th streets in downtown Sacramento. Now it boasts a steady stream of pedestrians, hanging baskets in bloom, and the bustle of its open air bike shop. So, what happened? The Old Soul Co. moved into the empty alley. Back in 2006, as they prepared to open their flagship cafe, Old Soul cofounders Jason Griest and Tim Jordan were pulling long hours and late nights to keep the lights on. The alley eventually became a part of the City of Sacramento’s alley activation pilot project. The Liestal alley activation has helped develop a repeatable model that can be used to revive Sacramento’s plethora of other alley spaces. 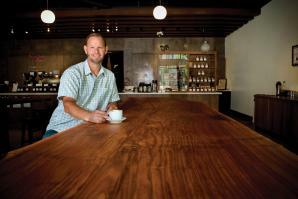 Insight Coffee Roasters made a similar neighborhood transformation at their location on S and 8th streets. From curbside outdoor seating, which creates a more walkable neighborhood and gets more eyes on the street, to remembering customers names, Insight has cultivated a community gathering place that’s changing the feel and energy of the neighborhood. 3. Attracting Top Talent: More so than ever, young professionals are relocating to cities where they’d like to live and finding a job once they’ve arrived. 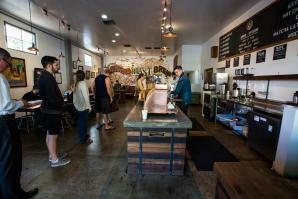 Coffee shops are proving to be a surprisingly important part of the attract-and-retain equation. The Warehouse Artist Lofts on R Street is being designed in partnership with the Capitol Area Development Authority to incubate Sacramento’s creative economy, and will soon feature a coffee shop on the first floor to help kick things up. According to Todd Leon, development manager with CADA,when local artists were asked what they’d like to see move into the retail space in the lofts, a coffee shop overwhelmingly made the top of their lists. The establishments that locals like you and I choose to keep in business with our patronage impact the pulse of our city’s streets, the new residents our neighborhoods attract and the economic stability of the region. It stands to reason that if we want to revitalize our neighborhoods, build a livable and lovable city, attract and retain top local talent, and keep small businesses in business, we should support the businesses who share our vision for Sacramento, and who make their business decisions with that vision in mind. Coffee houses seem like a decent place to start. 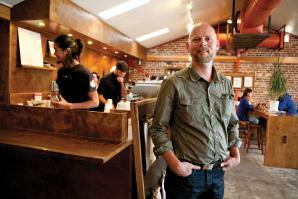 What’s your favorite local spot for a cup of joe, and why? Let us know in the comments. Mikhail Chernyavsky, host of Comstock’s Emerge video series, takes a behind the scenes look into Insight Coffee Roasters, where owner Lucky Rodrigues shared his vision for midtown’s newest coffee shop, his goal to develop sustainable relationships with producers and his take on launching a business in Sacramento. Among the Capital Region’s top-notch talents, some designers stand out for their ingenuity, skill and varied contributions to the fabric of local culture. Tree aficionado Clark Kayler rescues fallen elms, walnuts, sycamores and redwoods — giants that have lined the streets of midtown Sacramento for more than 100 years — and grants them new life in the form of furniture.